THE OLD BOOK TABLE grew out of the earliest efforts to organize the antiquarian book trade in America. The English trade had the Antiquarian Booksellers Association, founded in 1906, to which several leading American booksellers belonged, but there was nothing like it in America. In a Spring 1930 issue of Publishers Weekly, E. Byrne Hackett, proprietor of New York’s Brick Row Book Shop, contributed a short article entitled “The American Rare Booktrade Should Organize.” At the same time, a proposal for such an association of American antiquarian booksellers was being promoted within the trade by Hackett and three other New York booksellers: Ernest R. Gee, Edmond William Nicholls, and Edgar H. Wells. On June 25, 1930, eighteen booksellers were invited to a dinner in New York “for the purpose of testing opinion on the advisability of an American Antiquarian Association.” There was considerable debate, but the consensus was that antiquarian booksellers were not ready for a trade association. As a social function, however, the dinner was an enormous success, and most wanted the social aspect to continue. On January 9, 1931, Ernest Gee, Byrne Hackett, Edgar Wells, Geoffrey Gomme, and Frank R. Thoms met for dinner. Ernest Gee proposed that their antiquarian booksellers group be called the “Book Table.” The proposal was seconded by Byrne Hackett and approved by the others, and these five individuals became the founding members of the club. 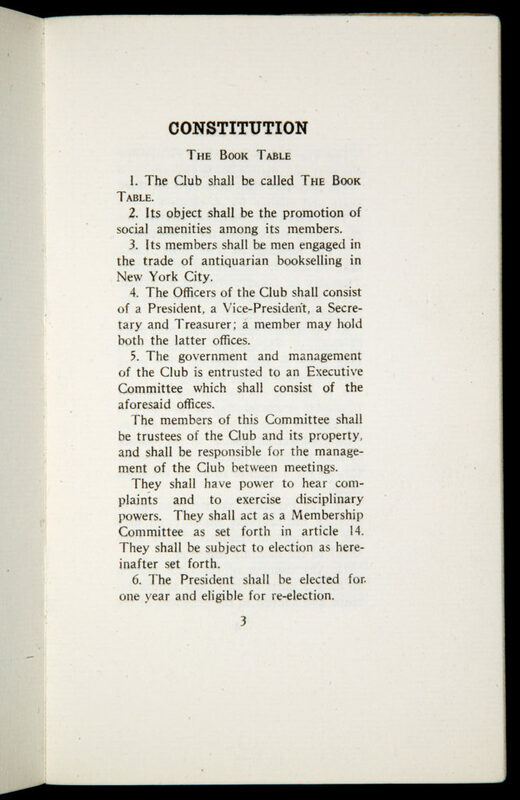 A meeting was arranged for the following month, and on February 6 the founders held their first regular meeting, to which they had invited three other New York booksellers: James F. Drake, Max Harzof, and Alwin J. Scheuer. 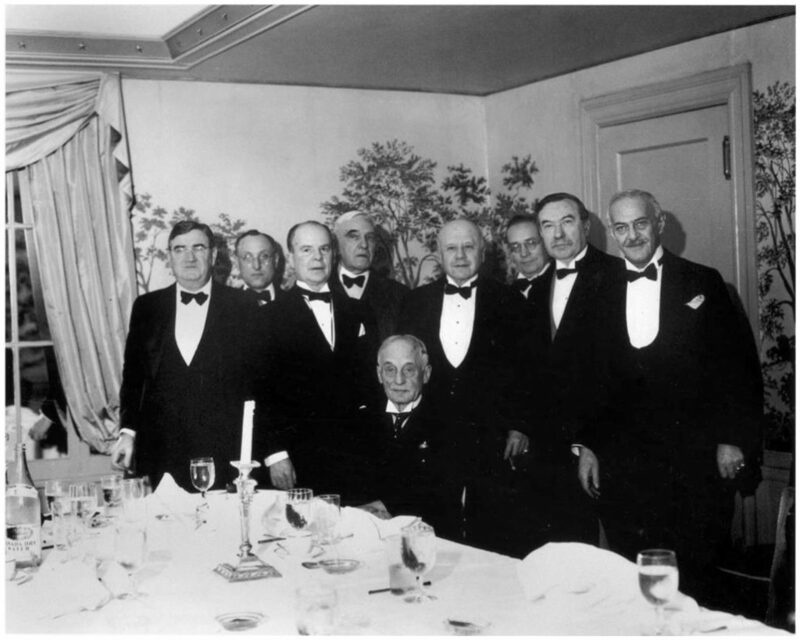 The eight booksellers attending this dinner elected four others to their group: Marston E. Drake, James H. Drake, Alfred F. Goldsmith, and Isaac Mendoza. Shortly thereafter, Edmond C. Bonaventure, Lathrop C. Harper, William Gannon, Gabriel Wells, and A. S. W. Rosenbach were elected members. These seventeen individuals made up the Table’s membership for the first several years. Prohibition was in effect, but the Noble Experiment appears to have had little impact on the Old Book Table. The Depression, however, was quite another matter. Times were difficult, and booksellers’ inventories were not moving. 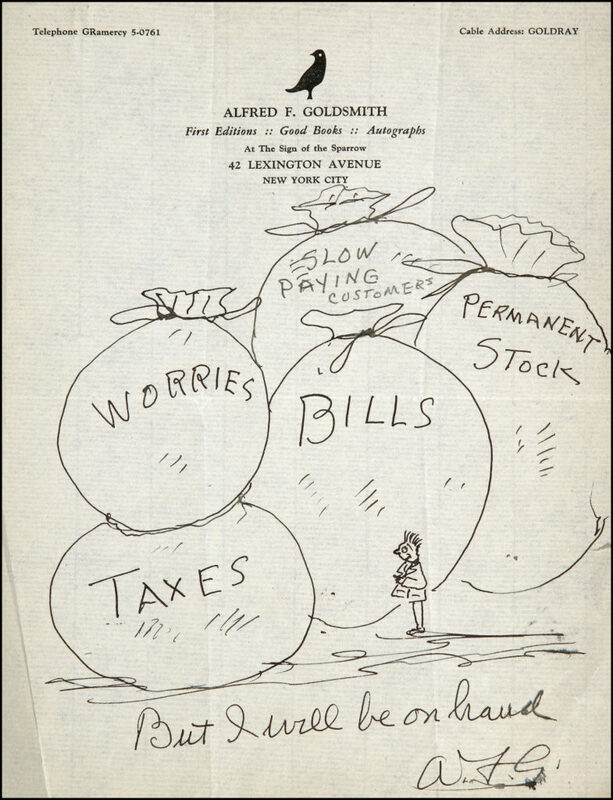 Alfred Goldsmith’s letters to Ernest Gee frequently depict, in words and caricatures, the state of the antiquarian book trade in the early 1930s. In the days that are to be? My heart is filled with fears. My eyes shed bitter tears. Must sell them to themselves. Then put them up again. In 1932 Lathrop Harper presented to the Table a pair of inscribed silver candlesticks. The Harper candlesticks are a cherished possession, and to this day they occupy an honored place at the table during every meeting. At the January 1933 meeting, the Book Table had its first guests: Charles des Graz of Sotheby and Company, and E. P. Goldschmidt, bookseller, both of London. Today, eighty-five years later, distinguished guests from the book world—collectors, librarians, and booksellers—are invited to almost every meeting. Later in 1933 the Table’s first constitution was written and printed. It bears little resemblance to the Table’s present constitution. At the March 1934 meeting, with collector and author A. Edward Newton as guest, the Antiquarian Booksellers’ Provident Fund came into being. This fund, founded and nurtured by Newton in association with the members of the Book Table, was created to assist antiquarian booksellers in times of need. 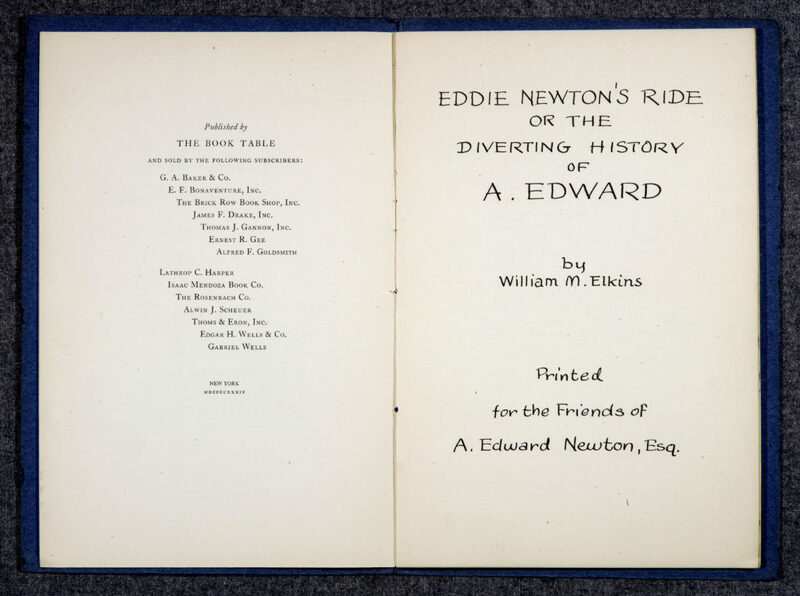 The initial income came from the sale of a pamphlet written and illustrated by William M. Elkins and published by the Book Table: Eddie Newton’s Ride or the Diverting History of A. Edward. In May of that year, A. Edward Newton was made a special honorary member of the Book Table, and the fund’s legal name was changed to the Antiquarian Booksellers’ Fund. I have just read that you have organized a publishing concern to be called The Book Table. The Book Table is the name of a group of booksellers, publishers, writers, librarians and others that has been meeting regularly once a month for the better part of the past five years. The group has avoided publicity of any kind and is very informal in its organization. Nevertheless, because of its membership, not wholly undistinguished in the book world, it seems to me that using The Book Table as an imprint is going to result in a certain amount of unfortunate confusion all around. Gee responded that the Book Table was neither a trade organization nor a publisher, “but simply a gathering of congenial spirits” who meet once a month for dinner and conversation. The records do not reveal anything further. The first mention of sartorial relaxation occurs in the May 1941 minutes: “Due to the unusual heat, most of the members appeared in street costume which was approved of heartily. Even the Treasurer departed from the stiff front, as is our custom.” By the end of World War II, black tie had given way to business attire, which remains the custom of the Table. In March 1947 the subject of aiding needy employees in English bookstores was discussed, and it was announced that the Table’s Antiquarian Booksellers’ Fund would be used. Over the next two years, with the assistance of the social service organization CARE, some fifty packages of food and staples were sent to employees in English bookshops. At the April 1949 meeting, it was announced that Parke-Bernet would be selling the autograph manuscript of Lincoln’s final version of his Gettysburg Address, and each member present at the April meeting, along with guest Maxwell Hunley, put 25 cents into a pool and guessed the price. Guesses ranged from $1,330 (Alexander Davidson) to $150,000 (John Kebabian). The manuscript brought $54,000, and at the May dinner John Kohn was presented with the handsome sum of $3.50 for making the closest guess, $51,000. Beginning in the late 1940s a second attempt was made to create a national association for the antiquarian book trade in America, and the subject was discussed at length in Old Book Table meetings. Finally, in 1949, the Antiquarian Booksellers’ Association of America was founded. Its presidents for the first five years, and many of its early officers, were members of the Old Book Table. In 1950 the Table left its longtime meeting place, the Hotel New Weston, and moved to the Grolier Club, where meetings are held to this day. — Extracted from Joseph J. Felcone, The Old Book Table. A Record of its First Seventy-Five Years, 1931–2005 (New York: The Old Book Table, 2006). Printed for private circulation.